Two University of Bedfordshire graduates used Steps funding to set up a dance company in their final year. Jess Hobson and Tenita Williams developed the undergraduate Steps Dance company using their experience of choreography and performance. They have gone on to form the JT Dance Company. The Vice Chancellor’s Steps funds granted over £6,000 to the Step Up project, an initiative providing ‘Opportunities for Performing Arts students to develop as creative entrepreneurs and to showcase their work’. 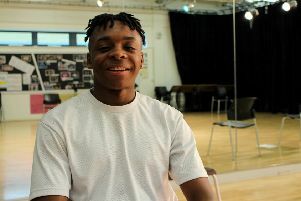 Tenita, 22, said: “It was great to have the opportunity and support to be able to set up the dance company for undergraduates in our final year. The funding was really important to setting up the company. “The university was very supportive. We would not have been able to set it up without them. The project aimed to provide support for students and to help them make the transition into the professional performance industry. They performed at the Current festival in November, an event which showcased multiple forms of art. It was arranged by RAW: natural born artists, a worldwide arts organisation. Jane Carr, the acting head of department of Performing Arts and English, said: “We are delighted that Steps funding helped support Jess and Tenita to further their ambition and that they continue to offer opportunities to UoB students to gain performance experience.